Preheat the oven to 350 degrees. 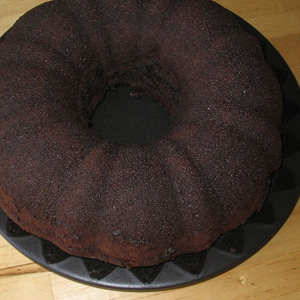 Grease and flour a 9-cup OR a 12-cup bundt cake pan. Cream the butter, sugar, eggs and vanilla in a large mixing bowl; blend in the sour cream. Combine the cocoa, flour and salt. Stir the baking soda into the buttermilk or sour milk; add alternately with the dry ingredients to the creamed mixture. Beat for 2 minutes at medium speed. Pour the batter into the prepared pan and bake for 45 to 50 minutes or until a cake tester inserted in the middle of the cake comes out clean. Cool for 10 minutes and then remove from the pan. Cool completely; frost or drizzle with glaze.